Eighty percent of users say the technology saves them time, and three out of four believe it has reduced errors. Care coordination technology from vendor TrekIT Health, which was initially developed in 2016 at Penn Medicine. One of the main issues faced by Penn Medicine and the inpatient consult service at the Perelman School of Medicine at the University of Pennsylvania is accurate, rapid, reliable transfers of information between teams. Whether sharing information between a team of primary care doctors during the handoff process, communicating with consulting specialties or gathering information across multiple hospitalizations of the same patient, seamless and consistent data sharing is paramount for providing the highest level of care. While electronic health records have their place in the IT ecosystem, they lack the usability necessary to meet clinicians' needs in these areas, said Dr. Misha Rosenbach, director of the inpatient consult service at the Perelman School of Medicine at the University of Pennsylvania and associate program director of the dermatology residency. "The interface requires multiple steps to understand a cohesive patient history with lengthy, often difficult-to-read progress notes that do not really fit into the clinical workflow, often adding to duplicative administrative work and taking clinicians away from patient care," he said. 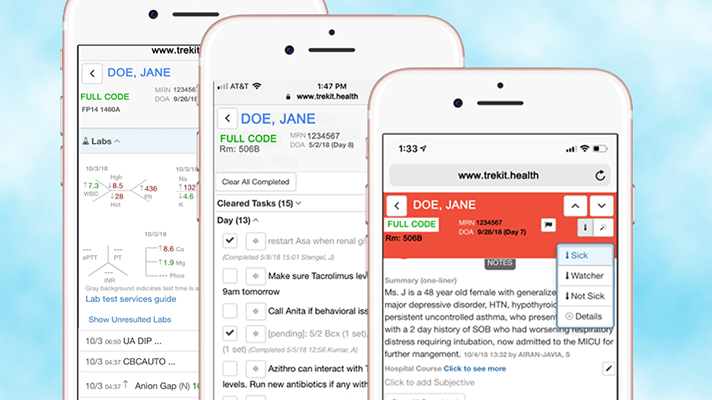 Penn Medicine decided to partner with care coordination technology vendor TrekIT Health, which was initially developed in 2016 at Penn as a product called Carelign to reduce clinicians' reliance on paper in clinical workflows and communication. It has been successfully adopted by almost all inpatient services at Penn Medicine's four urban hospitals. This year, the clinical lead for the project has since co-founded TrekIT Health to commercialize the product as TrekIT. TrekIT helps in each of the aforementioned settings – knowing where patients are in the hospital, who is seeing them, what the clinicians are thinking, and then communicating all of that information safely, securely and simply among and between various healthcare teams, Rosenbach explained. It does so in a way that's "easy to read, review and visualize, even while walking around doing rounds in the hospital, or when called to see an acute patient, because you can readily see the important data you need, and read about the active issues on your phone while you are walking to the patient's room," he added. TrekIT gives providers a collaborative space to put their thoughts together and intuitively pairs them with the chart so they can see the doctor's notes without a lot of "fluff," use copy/paste, use repetitive text, and handle billing/medical-legal documentation, said Rosenbach. "You get the core information, paired with the most updated labs, paired with the patient location, and you get it in real time, in a way that you can easily digest it and find what you are looking for on a mobile device," he said. There are a variety of care coordination technologies on the health IT marketplace. Vendors include Cipherhealth, eQHealth, GSI Health, Imprivata, Microsoft, Optum and pMD. TrekIT's platform is integrated into Penn Medicine's Epic system, but it is also available in a browser from any desktop or, more important, from any mobile device. The tool brings real-time vitals, labs and medications, critical elements clinicians need to see. Because of the technology, physicians now are able to coordinate and collaborate between all members of the clinical team, from doctors to nurses, therapists and others. "You get the core information, paired with the most updated labs, paired with the patient location, and you get it in real time, in a way that you can easily digest it and find what you are looking for on a mobile device." "Our group is a primary consulting service, so our role is to see hospitalized patients and add our thoughts on our organ-system and how it impacts their hospitalization," Rosenbach explained. "We are moving toward using TrekIT as our main handoff tool, for example, during service changes, to use this as a way to conveniently convey our team's thoughts and active treatment plan/issue management on our consult service from one team to another," he added. Click on page 2 below to read how Penn Medicine reduced readmissions and risk-adjusted length of stay, and more.